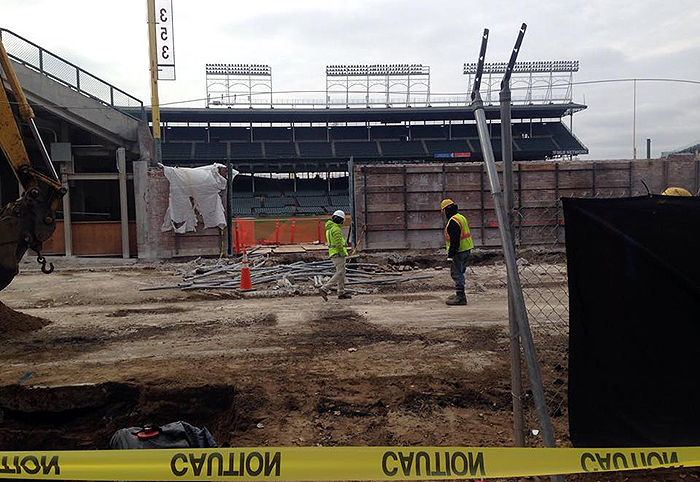 StoryMap: Where are the renovations taking place in Wrigleyville? The Chicago Cubs began their $575 million renovations on Wrigley Field in late September, causing a bit of chaos to residents in Wrigleyville. The renovations caused street and sidewalk closures, as well as bringing loud noises of construction that could be heard blocks away. Rebeca Barbosa of the 3000 block of Clifton Avenue says that in the morning she can hear the noises blatantly even when her window is closed. The project, which will take until 2017 for full completion, involves bulldozers, cranes, saws, welding torches, and dump trucks, which cause many different loud sounds throughout the day. The stadium is mostly made of steel, brick and concrete, so the demolition process requires cutting through it. Neighbors say it can be extremely loud at times. The construction usually starts early in the morning, before 9, and goes as late as 10 p.m., neighbors say. The construction even happens on Sundays sometimes, which means the noise from the renovation is happening all throughout the week. While the noise level may be annoying to some, other homeowners in Wrigleyville aren’t bothered by the noise at all. Diana Frigo, a 20-year-old DePaul University student who lives a block away from the field, believes that it’s just another sound that comes with living in the city. 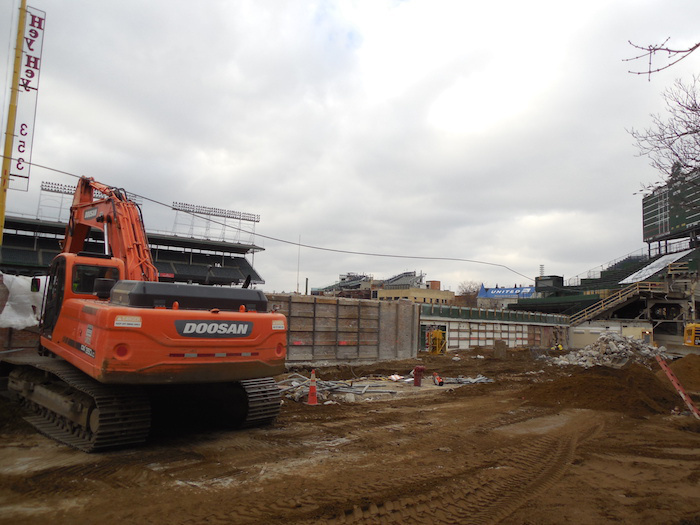 After months of harsh debates, the Chicago Cubs started their highly anticipated renovation of Wrigley Field in late September. The project began with the demolition of the left- and right-field walls and bleachers. The first phase of the project will be in place by spring, but overall ballpark renovations – including new suites and press box – will stretch to late 2017. Plans also include a total of 600 new seats, wider concourse, new concession stands, new restrooms, new fan terraces, a new clubhouse for the team and a two-story retail and entertainment area. They will also move the on field bullpens underneath the newly rebuilt bleachers, which will improve the safety of the players. The deal also includes packing two new signs in the outfield walls of Wrigley, two large electronic scoreboards in left- and right field, and another advertisement sign in right-field. Crews will also be constructing a new hotel and business center bordering the ballpark and will add up to 1,000 more parking spots for games. The Cubs, contacted several times, did not comment when asked about how these renovations are impacting the community. Residents say the construction has caused some traffic turmoil in Wrigleyville. This renovation closed down Sheffield Avenue from Waveland to Addison and Waveland Avenue is currently closed for three blocks from Sheffield Avenue to Clifton Avenue. This has caused overflow traffic onto Halsted Street, Clark Street and even Southport Avenue. Wrigleyville resident Morgan Lockwood says that she finds issues when driving around the area because of the street closures. The renovations also impact local business. A proposed development at Clark and Addison, across from the ballpark, is expected to start in the spring. It would take out Red Ivy, the former Goose Island, Salt & Pepper diner on Clark, as well as 7 Eleven, Starbucks and a T-shirt shop on Addison. Wrigleyville has seen several new bars and renovations over the past few years in preparation for the renovation. A new Culver’s is going in on Clark Street. Old Crow barbecue opened last year. Deuce’s Diamond Club on Clark is a couple of years old. Jay Schwartz, manager of Strange Cargo Tees, told the Chicago Tribune that the new renovations would bring more money to Wrigleyville, which makes the business owners around the ballpark quite happy. While Schwartz said he believes this new renovation is going to help his business in the long run, Jim Smith, a bartender at the local bar Murphy’s thinks otherwise. Many other residents also agree that changing the ballpark isn’t the best idea. Jake Smith, a loyal Cubs fan and Wrigleyville resident, says he doesn’t like what the new renovations will bring to the area of Wrigleyville. Construction is set to last nearly four years, which means all of the annoyance the renovations bring will have to stay for a little while longer.